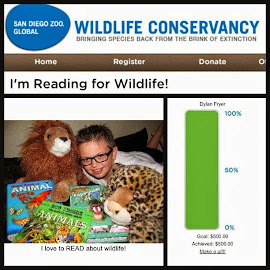 Over the years, I have spent hundreds of dollars making donations to various non-profit groups and organizations hoping to make some sort of difference. I went from making the minimum donation of $15 to several places, to now being more specific as to where I donate my money - but that's another post. My point is that one person can make a difference and you don't need to spend tons of money doing it. 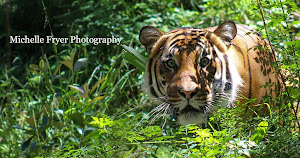 Awareness is one of the biggest hurdles faced in animal conservation. Today I am sharing three simple ways that you can raise awareness and help save animals for only a few dollars. 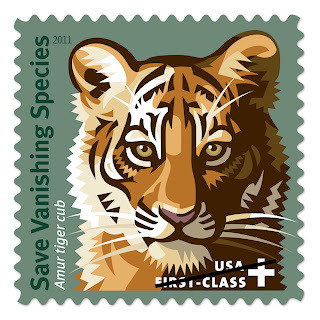 This is a first-class postage stamp and all proceeds over the current cost of a first-class stamp go directly to U.S. Fish and Wildlife Service to support the Multinational Species Conservation Fund. 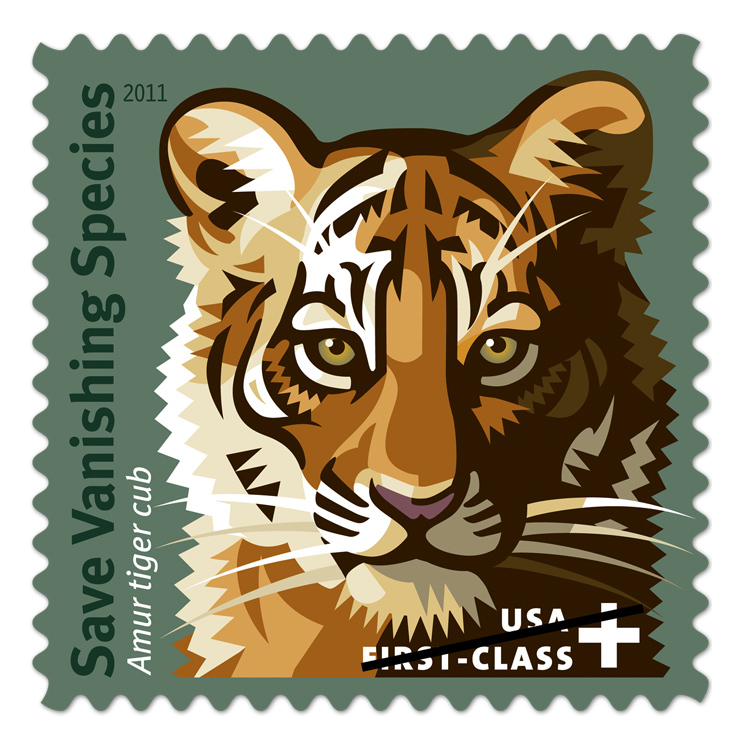 For more information on what conservation funds are supported by this stamp visit the US Postal Service website. Do you love having a unique screen lock picture and wallpaper on your iPhone or iPad? Do you admire great animal photographers? If you said yes, then this next one is definitely for you. In November 2011, the San Diego Zoo released the officially licensed digital skins through the iTunes store. For only $1.99 you can purchase this app and have some beautiful wallpapers and images on your phone. The app also includes app frames and shelves. 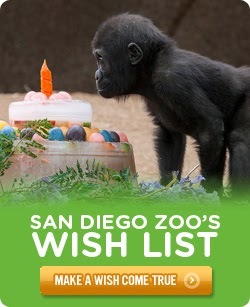 This is a wonderful way to support the San Diego Zoo and show your love for animals - and I can promise the pictures will being a smile to your face too. 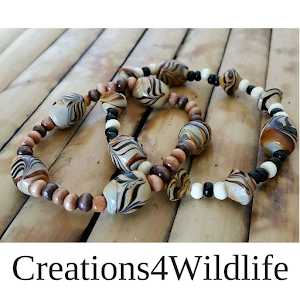 Another great way to support animal conservation and raise awareness is to follow your favorite organization on Facebook and Twitter. By simply sharing a post or re-tweeting something you find interesting may catch the attention of someone and before you know it a domino effect is in place. A few of my favorites organizations that I personally support through membership or direct donations are listed in the right side column of the blog. Looking for some organizations to follow? Take a peek at the pages we support on Facebook or who we follow on twitter. Find your passion - whether it be wildlife, parks, or the oceans and start doing what you can to help. As I mentioned the other day, there will be some changes happening here on the blog. You've probably already noticed a slight design change - including the color scheme and a new header. Don't worry, you are in the right place. Life with Dylan (my son, not the blog) brings a smile to my face every day. The way this kid teaches me about animals, shows me the world through his eyes, and inspires me to see the world a little differently than I did before will never cease to amaze me. I'm excited to be sharing more of these inspirations with you and hope that you will continue to follow Life with Dylan as we transition to the new blog design. A few more subtle changes will occur over the next few days and I hope you will like the new blog as much as I do. A few of my favorite pictures from our trip to the San Diego Zoo Safari Park earlier this month. Just look at the wingspan! Bats - Cute or creepy? I haven't decided yet. This has got to be one of my favorite Dylan shots - Hamming it up for the camera. 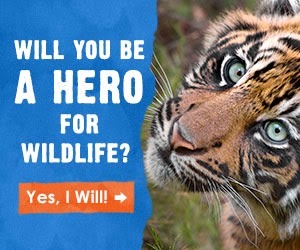 I must save the jeep so I can protect the animals! Sometimes pictures say more than words and these beautiful animals make wonderful subjects. The pictures may speak volumes, but the animals can't speak and they need your help. Get involved with wildlife conservancy and help bring species back from the brink of extinction. As frequent visitors to LEGOLAND California, I can tell you that a day filled with LEGO is wonderful. However, when you combine LEGO and the ocean together you get SEALIFE Aquarium - even more fun for the family! 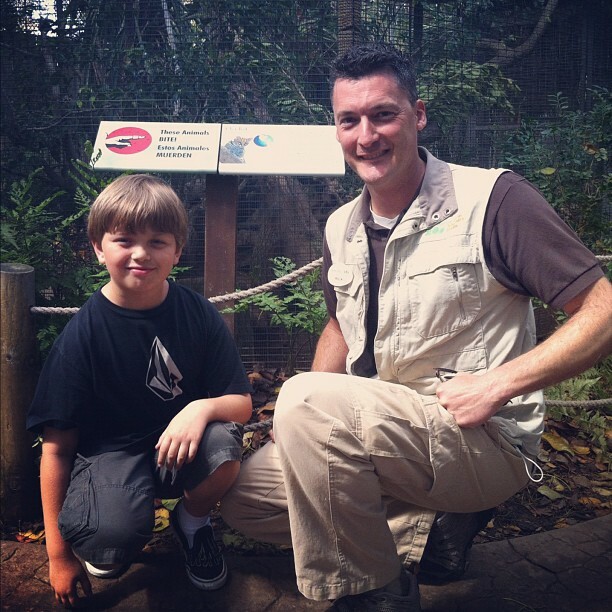 On a recent visit to LEGOLAND California, we took some time to see the SEALIFE Aquarium too. After the fascinating Octopuses Garden exhibit, we were excited to see what the new Claws exhibit had to offer. Wow! I have never seen such huge lobsters and crabs. These animals are simply beautiful, especially the spider crab - and I learned so much about crabs. Like did you know that the Coconut Crab can exert five times the amount of pressure required to break a human bone? That's one strong crab claw! Of course the rest of the aquarium is pretty cool too. 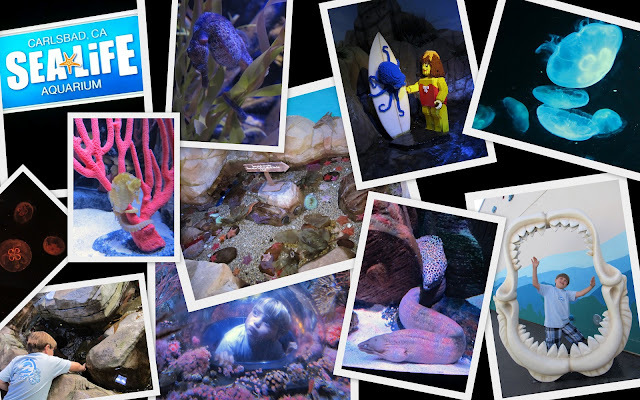 Jellies, seahorses, eels, and LEGO sculptures. 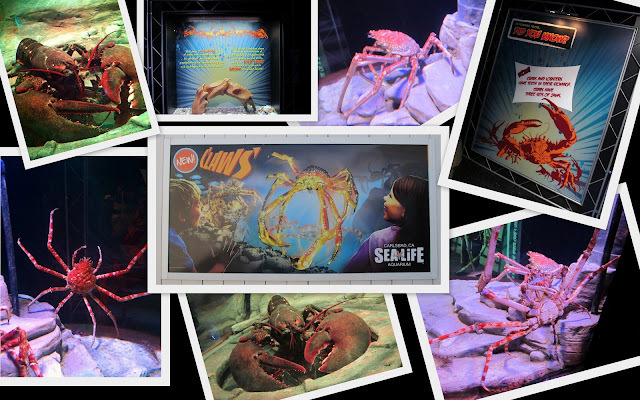 SEALIFE Aquarium is a fun afternoon for the whole family, but why not make a day of it and visit LEGOLAND California too? You can buy a park hopper ticket to visit both, or if you are a member like we are, it only cost $15 to visit the SEALIFE Aquarium. If you have children, then you probably know about the little seedling that comes home from school in 3rd grade in honor of Arbor Day. Well, 34 years ago I brought home one of those little seedlings and cared for it until it grew big enough to put in a real pot. Then my Dad transplanted it into a larger pot - a big wooden crate one if I remember correctly. With a little water, sunlight, and love my tree continued to grow. My tree grew so big that when I was in the 8th grade it was time to transplant it again. This time we planted it in the earth - where it would grow and thrive. My tree has provided oxygen to the planet. A home for squirrels and birds. Shade for the plants growing beneath it. Even more than the wonderful things my tree did for the environment, my tree was something that I could watch grow year after year. My tree provided a great story for people who came to the house. My parents recently decided to sell their home. No reason to have a huge 5 bedroom house when all the kids have moved out, so they are downsizing. Aside from the memories of my childhood home, I can't help but wonder, what will happen to my tree? Will the new owners keep the tree or will they, it hurts to even say it, cut it down? It's way to big now to transplant. I cannot control what happens to my tree anymore, but I can start a new tree with the seedling my son brought home a few weeks ago. I can start making new memories. Start nurturing a new home for animals. If your child didn't bring home a tree, that's all right. Go to your local nursery or nature center and buy a seedling of your own. Nurture it, water it, and love it. Plant your seedling and watch it grow. Who knows, maybe one day your tree will grow to be as big as my tree - or maybe even bigger. This picture was taken from the street to show the size of the tree in comparison to the 2-story house. Tomorrow is Earth Day and I urge you to plant a tree. Planning a birthday party? Who doesn't love cotton candy? Cookies, cake, ice cream, candy ... sure these all make wonderful treats for a birthday party, but are they ordinary? 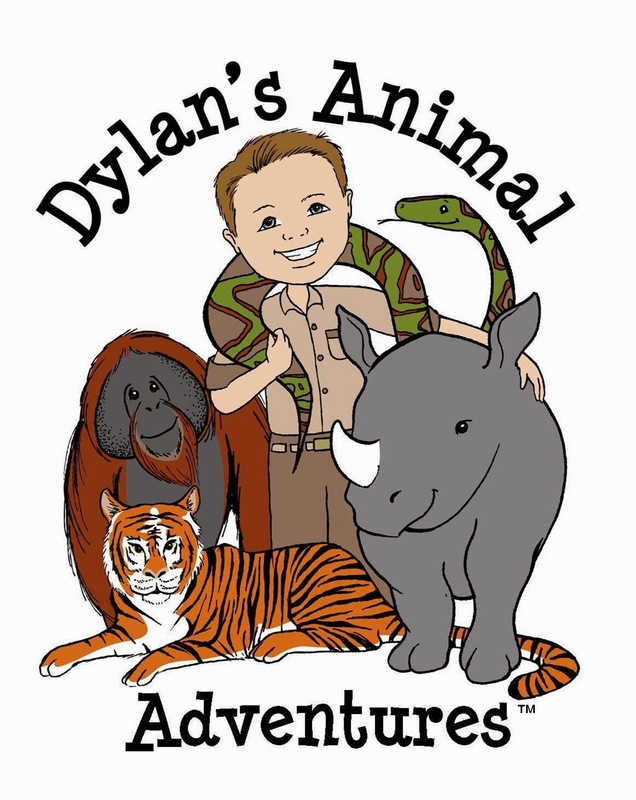 Dylan's birthday is coming up in July and once again, I have the daunting task pleasure of planning a party. 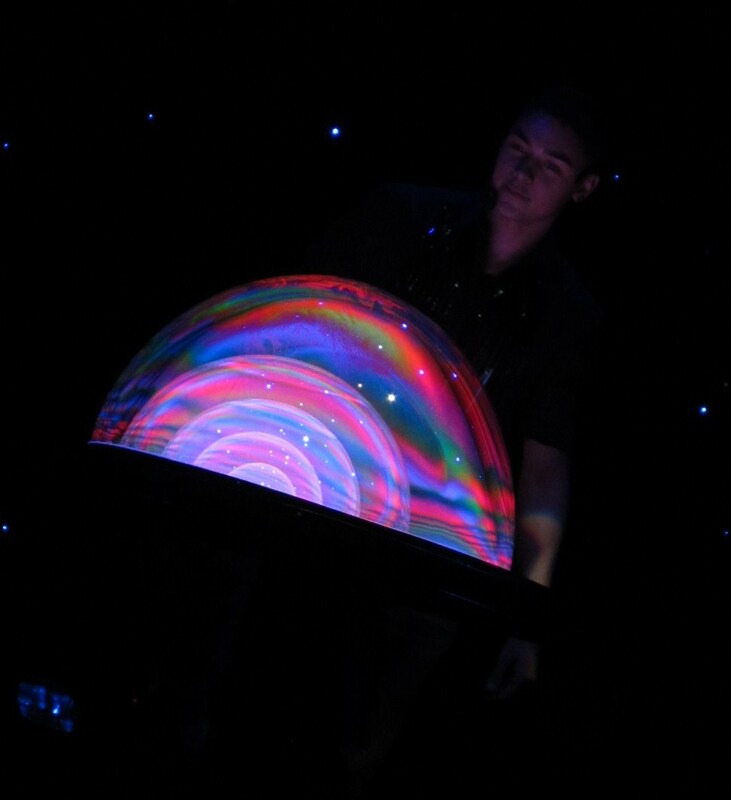 Something that will wow my child and make him feel like the most special kid in the world. That's what we do right? As parents we tend to spend obscene amounts of time and money to make a child's birthday party better than the one we threw the year before. Right? You know this sounds familiar to you. Yes, that's what I remembered from my childhood. What child wouldn't love cotton candy at their birthday party? So although my son is still undecided on where his party will take place, I have finalized the sweet sugary goodness that will fill the kids tummies. 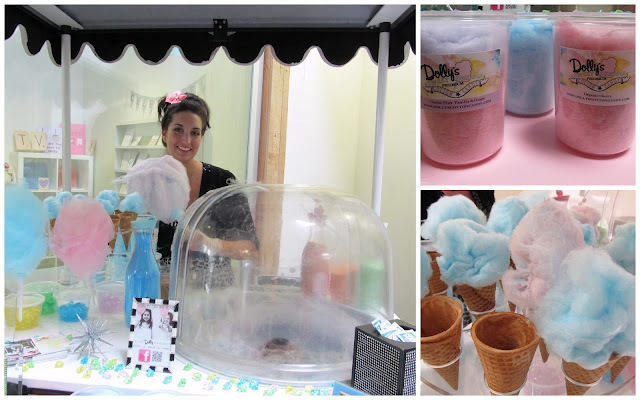 Dolly's Sweet Dreams Cotton Candy is the cutest concept for any party or special event when you want to make people smile. The owner, Krista Thompson, is as sweet as can be and just look at the pink cart - adorable! Dolly's Sweet Dreams Cotton Candy offers nine classic cotton candy flavors and seven organic flavors, surely I can find a color/flavor to match the theme of Dylan's party. Plus, Krista will create custom labels for my event if I choose to have to-go tubs. There is something about cotton candy that simply makes me giddy - like a kid again. I think I need to come up with a reason to have a party before my son's birthday in July just so I can have more of Dolly's Sweet Dream Cotton Candy! Be sure to visit DollysCottonCandy.com for more details on how you can book an event and "like" Dolly's on Facebook to see the latest pictures from parties where fluffy cotton candy has created smiles on the faces of children (and adults too). I love how the rays from the sun seem to form a flower in the sky - very appropriate considering I took this picture in a garden. Well, Spring Break is over. I have gone back to work. Dylan has gone back to school. No more staying up late and sleeping in. It's back to the daily grind of packing lunches and homework. It all depends on how you look at the situation. We both had so much fun over the break on our mini-vacation in San Diego (yes, I will be posting pictures and sharing soon) that we have decided to adapt to the vacation mode lifestyle. At least as much as we can and still manage to go to work and school. Over the break we led a simple life. No real schedules, no hectic going from one place to another. We talked more - real conversations. 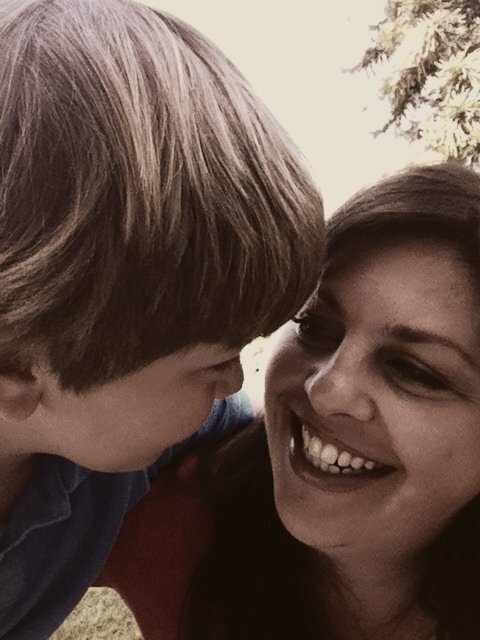 We laughed more and I believe our bond as mother and son strengthened because my attention was focused on us. On our family. Not on what had to be done around the house or checking emails. He said please and thank you more. He actually put things away without me asking him to. This went on the whole week of Spring Break and has continued. Was this my son? Why the sudden change? Well, as with any change, it is best to look at what was done different in your daily routine. 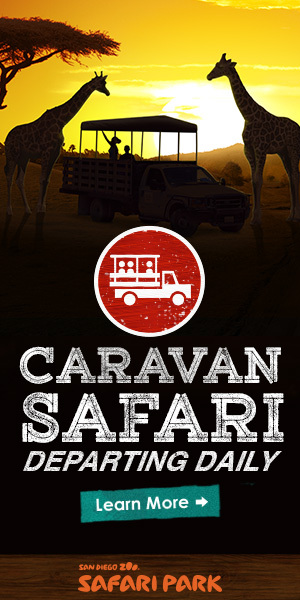 Knowing that I couldn't really count going to the San Diego Zoo, or the San Diego Zoo Safari Park, or staying at a hotel for two nights, I had to think. What had we done different. Ah yes, that was it. We were talking, not arguing. We were smiling, not pouting. We laughed instead of crying over hurt feelings. We treated each other with love and respect. Something happened in San Diego, and I can't quite put my finger on it - but I'm not complaining. I like adapting to a simpler life. Enjoying what each day brings and planning new things to do together - as a family. Because when all is said and done, the strength of a family can move mountains. Me and Dylan - we're moving some mountains. As a parent, I believe it is my job to help my son be the best he can be. To inspire him to follow his passions. To support him in his choices. To love him for having the drive and aspiration to learn more about the world around us. We just spent three days in San Diego on a mini-vacation for Spring Break and aside from being exhausted from all the walking, I came to a realization. Not really a big surprise, but one that I know now I must support. My son has a deep love and compassion for animals. He thrives on learning more about them and sharing his knowledge with others. He respects the animals and their environments. 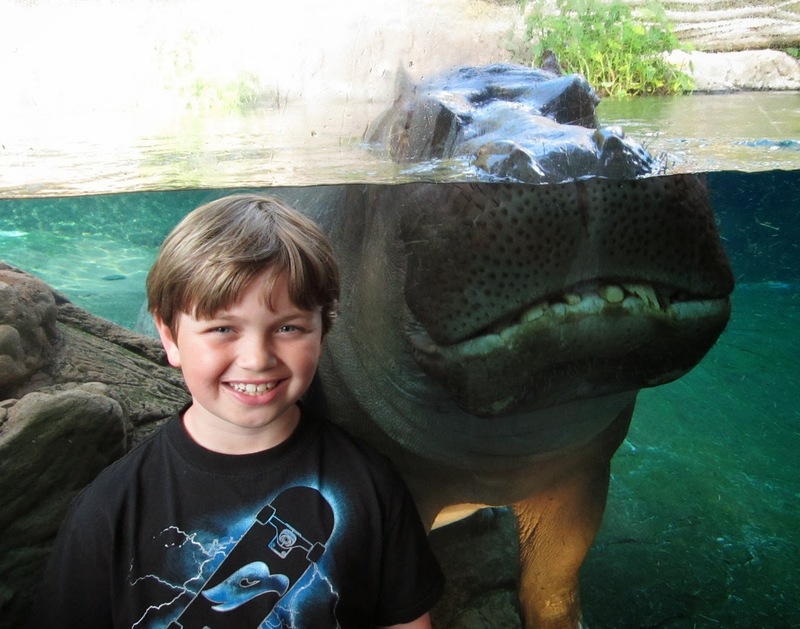 Sometimes, to my embarrassment, he actually corrects tourists at the zoo. The other day there was a group of kids screaming inside the panda exhibit and he said, "Mom, can't they read the signs? It says to be quiet in here." He started to get really upset and proceeded to tell the kids to be quiet. During another instance, some people referred to the meerkats as prairie dogs - big mistake. Yep, he corrected them ... while I looked the other way. This got me thinking. When did his love for animals start? 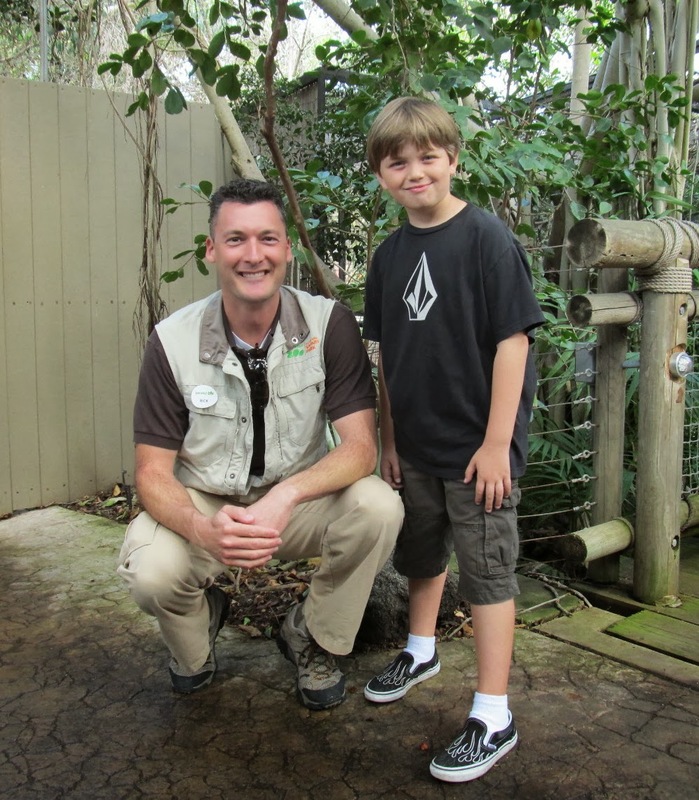 The highlight of Dylan's day at San Diego Zoo Safari Park was the 20 minute conversation he had with Zookeeper Ron about the condors and what it takes to become a zookeeper. His love of animals was so apparent yesterday and I truly believe he will do something amazing with animals when he grows up. When the weight of the world seems to be crumbling around you, even the smallest task can become overwhelming. This has been the story of my life for the past few weeks. As much as I wanted to be perfect, like this rose with each petal meticulously forming around the other, I just couldn't do it. Finding perfection and beauty in anything was damn near impossible. I was depressed and couldn't snap out of it. I did my best to put on happy face and pretend that everything was OK - but inside I knew that it wasn't. Inside, I was screaming for someone to make the pain go away. To make the imperfections I was feeling go away. I was tired, no exhausted. Mentally and physically exhausted. My world seemed to be spiraling out of control and the only thing I could control was how I treated myself. I could be hard on myself and notice every single flaw. Every single petal that was not quite right. Like this pink rose with petals falling off, I was flawed. I have gained weight and that upset me. How did I cope with this? By eating more of course. Then I could turn around and be mad at myself for eating. This I could control. I'm not happy with my home. The clutter and chaos has taken over. Who needs words when you have bubbles? Bubblefest at Discovery Science Center runs now through April 22 and is a must for your family this Spring Break! Well, I did it. 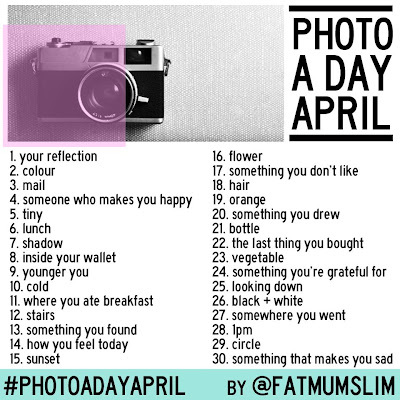 I completed the #marchphotoaday challenge created by @FatMumSlim. In fact, I had so much fun that I am going to take the challenge this month too. Now to tackle the month of April. Are you taking the #photoadayApril challenge? Give it a try - I would love to see your photos!